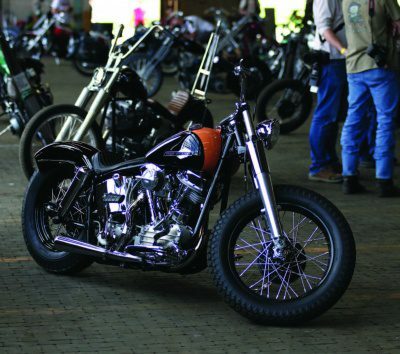 The Congregation is a motorcycle and hot rod show in Charlotte, North Carolina at Camp North End. 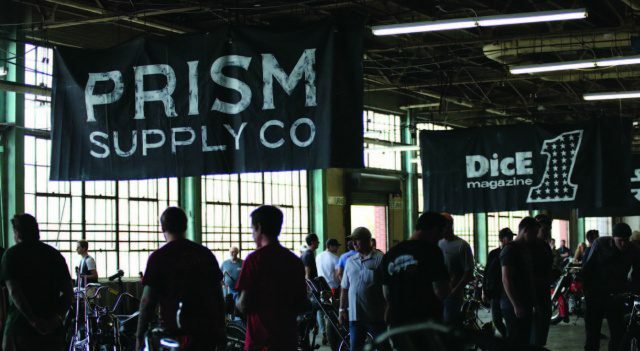 It is presented by Prism Supply Co. and Dice Magazine. 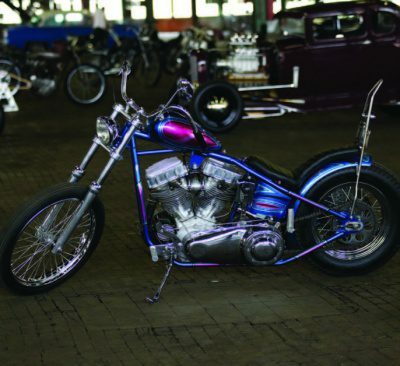 It’s a perfect setting for the blend of motorcycles and hot rods that are showcased. Camp North End is a historical warehouse located deep in the heart of Charlotte. Model T’s were once produced here, and then it became a factory for producing bombs during the war. Jake and Zach Hindes of Prism Supply Co. and Dean Micetich of Dice Magazine really did their homework when they started this show only a year ago. 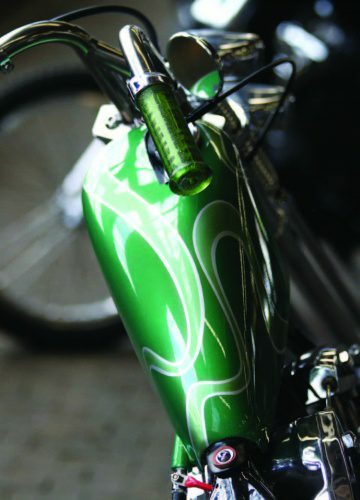 Prism has also set up home base at Camp North End and are putting out some gorgeous bikes. The brothers are fairly young and seriously talented. 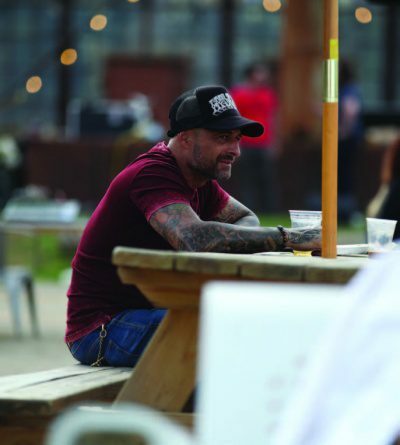 The show features live music, food trucks, vendors, a whiskey tasting room and a beer garden. A couple of swap meet vendors even set up this year! The weather was absolutely perfect. They switched it from May to April this year, and the move was spot on. 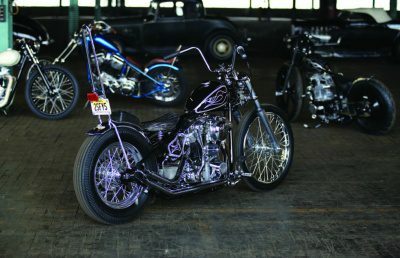 Rodders Journal took care of bringing in some righteous cars, and the bikes are selected from all over. Rodders Journal really brought the heat this year and the quality and craftsmanship was over the top. When you bring together the mutual love of passion and pride in vintage cars and bikes, it’s an absolute winning combination! The vibe is what this show is really all about. You feel the southern charm and hospitality as soon as you pull into the venue. 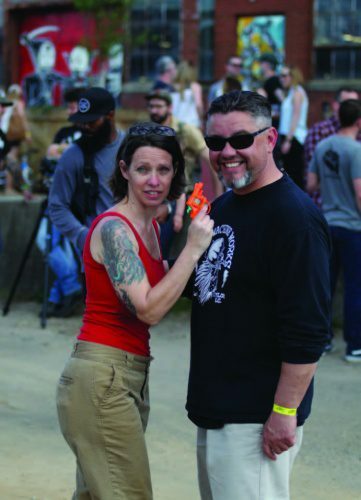 Charlotte itself already supports a growing motorcycle community and this year numbers are coming back in the realm of 5,000 people attending. That’s mighty impressive for the second year of the show. It’s family friendly, and the setting has the space to house easily double the number of bikes and cars. 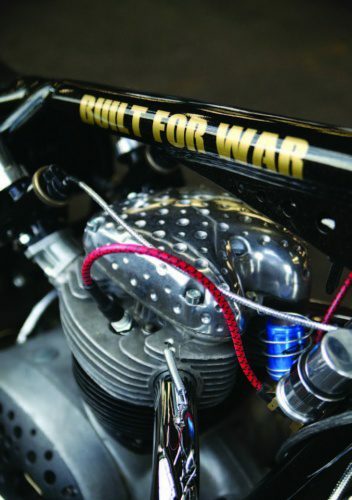 There are several builders in the immediate area that have filled the pages of Cycle Source over the last couple of years and continue to pump out super clean and timeless bikes. 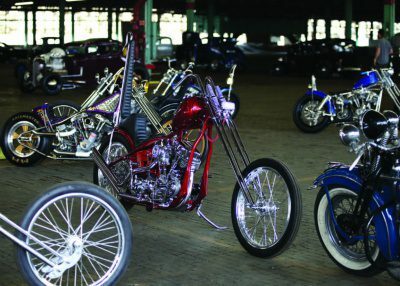 All of them had bikes in the show this year, last year or both years! 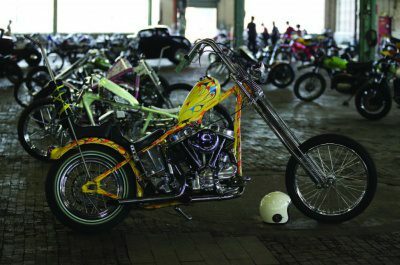 The crew of N.C. and S.C. boys are huge supporters of Cycle Source’s, Willies Chopper Time and Bill Dodge’s shows and party in Daytona. 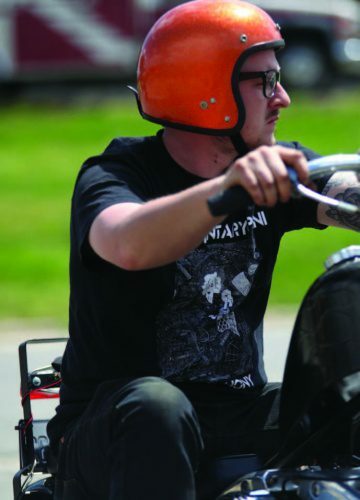 Ben Jordan and Chris Wade, Matt McManus of Waxhaw N. C., Eric Stein and Bryan Lane of Matthews N.C. all have some of the nicest shovelheads, Panheads and knuckleheads around and all agree that the show is a massive home run. Chris Wade has taken a page from Bill Dodge’s book and has a pre-party that is not to be missed. Even Bill himself is in attendance and considers it a home away from home. This show oozes family and tradition. The theme carries throughout the entire event and surroundings. It’s making waves fast! Harley Davidson even jumped on board this year and supported the show, and numerous photographers were on top of the action. MichaelLichter was working in conjunction with Harley Davidson and filling their feeds live on Instagram and Facebook. Pre-parties were abundant with southern BBQ, fire pits, and cold beer. 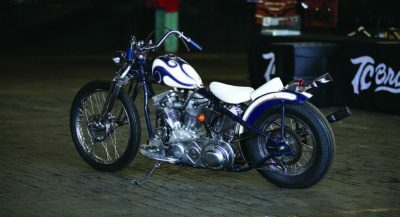 The venue really gives you the opportunity to get up close and personal with the builders of the bikes and hot rods. 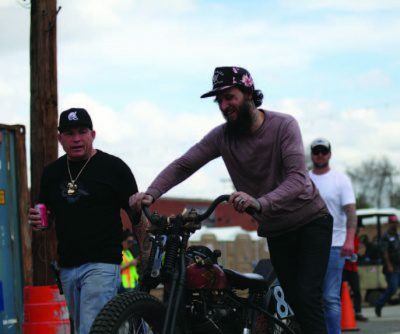 Some of the guys that have built bikes for The Race of Gentlemen brought their runners as well and talking with them is always a blast. It’s a much laid back setting, and you can feel the positive energy around the event because of it. 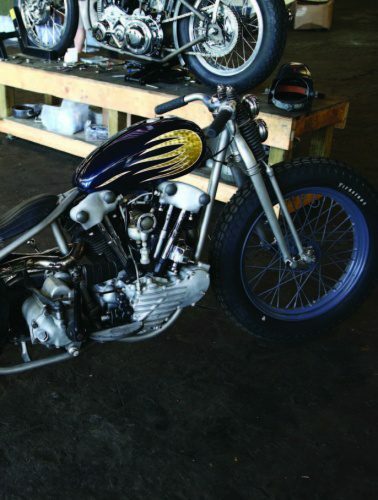 The bikes range from choppers, flat trackers, very close to original Harleys and this year they added a vintage dirt bike area. 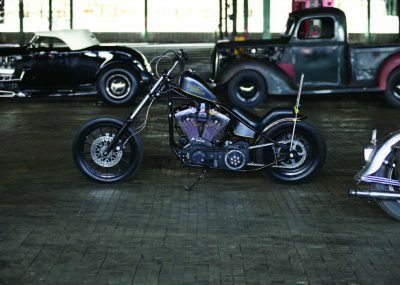 A little-known secret is that the vast parking lot houses some of the coolest bikes and cars. Camp North End sets on 76 acres and is huge! Everywhere you turn you can find something you haven’t seen yet. You can lay down and take a nap underneath a shade tree. Dance in front of the band or get lost in a sea of coolness inside. The show was from 2 to 8 pm this year and gives you plenty of time to take a quick rip around the city. Charlotte is a big little city and has plenty of hotels, camping areas, and local shops to fulfill your needs. There are no awards or trophy presentations to sit through. Just an after party to enjoy more of the good times! The Congregation needs to be on your list of must attend shows next year! This entry was posted in Shows and tagged Back Issue, Cycle Source, Cycle Source Magazine, Events, Shows, The Congregation Show. Bookmark the permalink.